The Egyptian forward has been incredible for the Reds this season, scoring 39 across all competitions and helping fire Jurgen Klopp‘s team into the last four of the Champions League. He netted in both legs of the last eight against Man City, switching from his usual right-sided starting point to play through the centre for most of the second leg. Salah, crowned the Egyptian King by fans this term, has quickly become a figure of adulation for the travelling Kop. And it seems the feeling is returned in abundance, with the No. 11 highlighting his happiness and excitement at playing his part for the Reds. “There’s something very special about playing for Liverpool,” he told CNN’s Becky Anderson. “The Champions League nights are special for the fans too. You can feel it on the streets. “The atmosphere in that first game against Man City was the first time I had really seen something like that. “When we saw the draw, everyone knew it would be a difficult game, but I said we had to be positive and win. The full CNN feature on Salah, shot in the city centre of Liverpool, will be shown in the lead up to the 2018 World Cup. 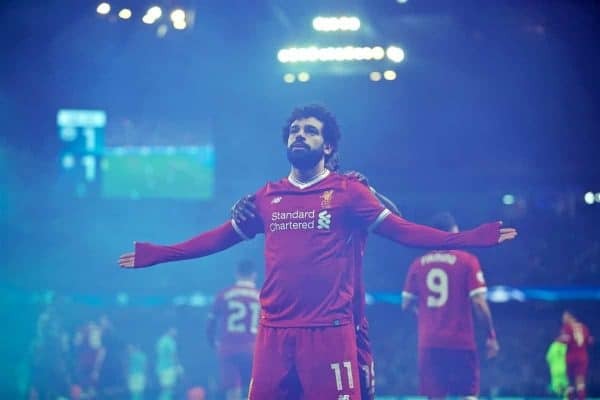 By then, Salah could well have fired the Reds to a first piece of silverware under Jurgen Klopp, with a sixth European Cup firmly in the team’s sights.